SOUTH BEND – The last time two Top 10 teams met in Notre Dame Stadium, Reggie Bush pushed Matt Leinart into the end zone and Notre Dame was denied a huge upset over Southern California. No. 8 Notre Dame avoided the same heartbreak Saturday night when No. 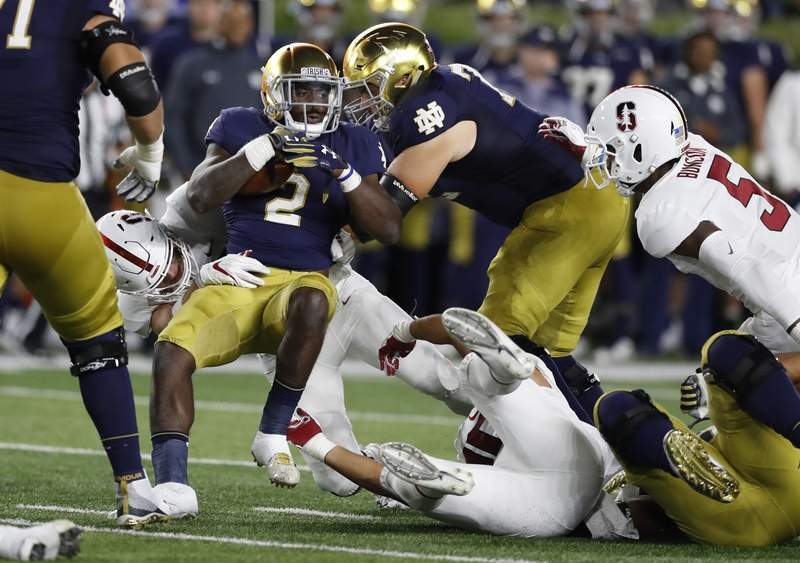 7 Stanford came to South Bend, turning what was a close game for the first three quarters into a rout in the fourth behind career nights from running back Dexter Williams and wide receiver Miles Boykin in a 38-17 win in front of an announced crowd of 77,622. "This is why our kids come to Notre Dame, to play in these big games," Irish coach Brian Kelly said. "They responded in kind. They started fast, I thought their attention to detail was great, great enthusiasm out there, and then we finished strong." The Irish captured the Legends Trophy for the first time since 2014 after three straight losses to the Cardinal. The win improved Notre Dame to 5-0, also the first time since 2014 that the Irish have started the season with five straight wins. "Stanford just makes me really upset because I haven't beaten them since I've been here," Boykin said. "Every other rivalry we have we've taken care of at least once since I've been here, so Stanford we lost three years in a row and that's unacceptable here." Williams missed the first four games of the season after reportedly being suspended for disciplinary issues in the offseason. On his first carry of the season, he broke a 45-yard touchdown run to give the Irish a 7-0 lead over Stanford. With freshman running back Jafar Armstrong out with a knee injury, Williams was Notre Dame’s top back, running for a career-high 161 yards on 21 carries. The senior running back, nicknamed "The Juice" declined to illuminate the reasons he missed the first four games, saying he's not focused on the past, but was eager to be back on the field. "I love the game of football," said Williams, who has the back of his hair dyed green. "Having that taken away from me, that was a big loss, it was a feeling I never felt before, not being able to step out there and cross that line with my boys. "It was something where I had to work hard, hold myself accountable and continue to hold myself accountable." With Armstrong expected to miss a couple of weeks with a knee infection and fellow running back Tony Jones Jr. felled by an ankle sprain against the Cardinal, Williams has suddenly become the Irish's No. 1 back. "He's such a great player," quarterback Ian Book said of Williams. "To know that he was coming back this week, I think our whole team rallied around him." The teams traded touchdowns in the first half, with Stanford’s Bryce Love racing 39 yards for a score to match Williams’ early touchdown. Notre Dame took the lead back with a 6-yard pass from Book to tight end Nic Weishar, but Stanford (4-1) answered again with a 4-yard throw from K.J. Costello to J.J. Arcega-Whiteside over the outstretched hands of cornerback Julian Love to make it 14-14. The Irish took the lead for good near the end of the first half. Boykin, who had a career-high 11 catches for 144 yards and a touchdown, caught a 33-yard throw from Book to get the Irish into position. Boykin was the first Irish receiver to catch 10 passes in a game since Michael Floyd did it against Boston College in 2011. "It's just the read," Book said, when asked why he so often targeted Boykin. "But our chemistry's coming along. He's such a good player and I love throwing to him." After Boykin's catch, Book completed the drive, eluding a sack, resetting himself and firing to Chase Claypool in the end zone for a 10-yard touchdown. It was one of four touchdown passes in the game for the quarterback, who has accounted for nine scores in his first two games as the starter. The Irish defense took over in the second half. Notre Dame held the explosive Stanford offense to just 31 yards in final 30 minutes of the game and negative-13 in the fourth quarter, when the Irish pulled away. Leading the charge was defensive lineman Jerry Tillery, who had four sacks and earned the game ball from coach Brian Kelly. Tillery had 4 1/2 sacks last season. "You can't block him one-on-one," Kelly said of Tillery. "He showed that tonight, he was outstanding. Anytime you have that kind of performance that just says a lot about his development. ... He wanted to develop a pass rush that would really take off and he's done that." The Irish put the game away with two touchdowns in 14 seconds in the fourth quarter, sandwiched around the first career interception for linebacker Te'von Coney. Touchdown passes from Book to Boykin and tight end Alize Mack sealed the win.